arts, ink. – Page 222 – Featuring weekly columns from University of Michigan student writers about arts and culture. This afternoon I had the very foolish pleasure of participating in an Ann Arbor tradition for the first time: the Festifools parade. Started a few years ago by an ingenious man named Mark Tucker, a few other staff members and students of the Lloyd Hall Scholars Program, Festifools is a hilarious and wild display of creativity. The students in Tuckerâ€™s LHSP class have spent the entire semester building larger-than-life, papier-mÃ¢chÃ© puppets that more often than not require at least three people to support. A group of Art and Design students have also spent the past few weeks constructing their own puppets, and of course anyone else is invited to join in the silliness. All of these artists and their volunteer supporters are then thrown onto about three blocks of Main Street, surrounded by hundreds of Ann Arbor residents and Michigan students. In the spirit of April Foolâ€™s day, and foolishness in general, most of the puppets were peculiar adaptations of classic characters or animals, or else somewhat satirical declarations about our culture. For instance I enjoyed one groupâ€™s juxtaposition of ancient Greek power and intelligence with the current Greek life culture of partying. I was beyond excited when my friend Carolyn asked me to help her support the giant, meth-addicted mermaid she spent the last few months creating. As we are both currently LHSP students, I felt a certain obligation to contribute to the parade. Also, Iâ€™ve heard how fun it is to participate. The stories did not disappoint. Although it was a bit tedious and strenuous to support a heavy, cumbersome mermaid, it was extremely enjoyable to allow the mindless routine of walking, waving and high-fiving consume my behavior. We all weaved and danced in a completely un-choreographed but nonetheless rhythmic array of messiness. After about five minutes the procession was much less in the form of a parade than it was a jumbled discord of costumes, drums and confetti. All this on a bleak, cloudy day. Nothing about it made sense, at all; but that of course, is the spirit of April Foolâ€™s Day. There is a Fluxus exhibit up in the Art Museum! And to celebrate, the UMMA has been hosting a variety of Fluxus events in their wonderful space as a means of promoting and expanding the ideas of a very, very unique and wonderful artistic movement. I had the pleasure of attending the premier of Professor Steven Rush’s new opera, U.S. Grant: A Flux-kit Opera as well as a performance of UM-Grad Robert Ashley’s In Memoriam… Kit Carson. But before I get to explaining the greatness of all these operas, you might be wondering…what exactly is Fluxus? What are you talking about?! Fluxus art is pretty well represented by a performance like this. It was all meant to make you question the boundaries of that which we call “art” and that which we call “life.” This youtube video is an example of a piece called an “event score.” These were “scores” (in the vein of a musical score) that indicated an action to be performed. It could be performed in front of an audience, alone, or not performed at all. It was all part of the art, all the point. Regardless of if you think this kind of thing is art or not (I’ll talk about that in a second…) you’ve gotta hand it to them for being innovative and very…different. And it really hasn’t died out at all-the movement started in the 60s and has continued to be doin’ it’s own experimental thing ever since. So, these operas that I got to see. The first was the Robert Ashley, a “30 minute longÂ decrescendo,” as Steve Rush described it. And gosh darn it, he was right. The piece itself was a group of 9+ participants sitting in a square around a central table. At prescribed times, they would act out certain actions (telling a story to another actor, putting on a record, clapping, etc…) but all at the same time. The result was a mass of sound-a blur of speech and other noises that started at a small roar and continued until its quiet end. It was fascinating to watch being performed. Downright hilarious at times, and at other points, really quite inviting and captivating. It really made me appreciate theÂ subtletiesÂ of the human voice-and how easily speech gets dissolved into a cloud of nonsense. But as I was sitting there I couldn’t help but get incredibly excited by the prospect of this opera. If simply talking to another human being was art what did that mean about my life? What should I be doing differently? What should I be doing with more intent-artistic or otherwise? And that’s the thing I think that is so cool about this Fluxus thing-it asks serious personal questions and might just make you a better person. But regardless, the Steve Rush opera is next on the queue. This thing was simply fantastic. Perhaps one of the most entertaining performances I’ve been to, ever. The opera itself was created through parameters set up by Rush-the parameters being a board game (“a cross between candyland and monopoly”) which generated all of the content for each of the scenes of the opera. From playing this board game, the performers in the opera (members of the School of Music’s Digital Music Ensemble) were given assignments of material to generate. For instance, a performer might be given a musical number to arrange-they would be given the music (one of 15 civil war songs) and the text (either a random passage from U.S. Grant’s memoirs OR a random passage from Gertrude Stein’s Four in America) and told to somehow combine the two in a unique arrangement. There were also readings of Grant’s personal letters, videos on Grant and his various attributes, and reenactments of important civil war battles/events. But oh, the reenactments. The performers urged the audience members on to join their ranks to create a battle on the stage. I fought for the confederacy and was shoved around by many Â unionÂ solider. And alas, we lost the war. But such is, I suppose. Regardless it was FANTASTIC fun to join the performers in the opera. It seriously pushed the boundaries of art for me. How can audiences participate in artistic events? Can something be that much fun and still be considered art? Can I be dragged up in front of 50+ people and forced to awkwardly dance the polka and still consider myself an artist? But all this gets at what I really took away from the evening-that the simple act of questioning is so enormously, vitally, INCREDIBLY important. And Fluxus, in my mind serves to do that. T force us to confront questions that we normally don’t think about. And if you end up on the side of the artist, your mind is expanded! And if you think that this isn’t art, I would urge you to think again, but at least you come out with a stronger resolve in what you believe in. I had a rollicking good time and send my warmest congratulations to Steve Rush, the Digital Music Ensemble, and the UMMA for daring to have such a program put on. To you, gentle reader, I urge you to go to the UMMA and check out this Fluxus exhibit. It’s incredible, inspiring, and beautiful. Go. Go and ask some questions. When crayon is used as a medium, it usually means imparting a thin layer of pigmented wax on another surface. When artist Herb Williams uses crayon as a medium, it means the crayonsâ€” frequently wholeâ€” are fitted together into bold sculptures that somehow simultaneously emphasize and defy the crayonsâ€™ uniformity and linearity. One of his most intriguing pieces of work is an outdoor installation of several freestanding sculptures, unearthly and bizarre. Unwanted Visitor: Portrait of Wildfire is the name of this installation, an ongoing project intended to â€œeducate the public about the causes of wildfire.â€ Each individual sculpture is unique, a colorful organism that might have been dropped, dollop-like, on the dry Texan landscape. Their bases would have been rooted to the earth, their ends twisted vaguely upwards by errant gusts of wind. Each of the set requires some Â­Â­Â­Â­60,000 to 70,000 crayons, the tallest reaching eight feet. It is an organically evolving sculpture, a long-term display that morphs over time as it sits in the sun, melting and morphing. The heat transforms the form of each piece as it cracks and slumps, gathering a expert predictions today molten mantle about its feet as it melts, colors mingling and mixing, then re-hardens as it cools overnight. In some places only the crayonsâ€™ empty paper wrappers remain, held in place, perhaps, by melted wax caught in between. Unwanted Visitor was first installed at the National Ranching Heritage Center in Lubbock in the autumn of last year and is as of this writing still there, still changing. Williamsâ€™ installation is designed to react to unpredictable environmental conditions, sensitive to shifts in temperature, humidity, and wind. Small changes in such conditions can mean drastic changes in the nature and appearance of the sculptures. 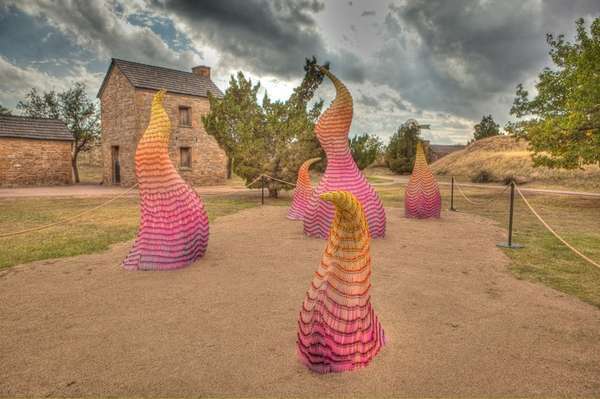 Aside from emphasizing the volatility of wildfire, the sculptures effectively serve as an active reminder of the fact that it is not the only thing that is so; just because something is large or powerful does not mean it is immovable, unchangeable, permanent. A greatly altered appearance, too, is no good indicator of its basic nature. Most things seen at any particular moment will be there one moment and gone the next, but it will be back again, though perhaps not in exactly the same way. This is my third year at the University. Â It is also my third year working for an incredible organization called FestiFools. Â FestiFools is, put most simply, a giant puppet parade that takes place in downtown Ann Arbor each year on or near April 1st. Â It is a celebration of April Fool’s Day and all of the foolishness that comes along with it. Since I have been with FestiFools it has expanded into an entire foolish weekend. Â We are entering our second year of the Friday night event called FoolMoon, which is a beautiful brilliant procession of illuminated lantern sculptures that culminates in a raucous street party in downtown Ann Arbor. FestiFools is stringing together the two days with a benefit concert at the Blind Pig. Â So we now have a whole weekend to ourselves to party and witness some truly beautiful and creative pieces of art. Â My favorite part about FestiFools and FoolMoon is watching the faces in the crowd. Â I spend months around these ten-foot tall puppets and luminaries, so I can sometimes forget just how awe-inspiring they are. Â But when you see a puppet give a five-year-old in the crowd a high five and see the pure joy and surprise on the kid’s face, well, it sticks with you. When I first began working for FestiFools I was a research student with UROP. Â I worked on ways to make FestiFools more marketable and gain larger audiences for the big day. Â I was pretty successful. Â Between FestiFools’ growing name (it was the 4th annual parade my first year) and my increased publicity, we reached about 5,000 Ann Arborites and friends that year. Â When I found FestiFools in the UROP catalog it was under the name START Project or Street Theater Art Project. Â As a theatre major, I thought that sounded pretty cool. Â Little did I know that I would be suddenly thrust into the world of public art and learn just how important free and accessible art can be to a community. I’ve always been an arts advocate, but a lot of my enthusiasm came from wanting there to be a job for me when I graduated. Â I still think that is an important thing, but my mission when promoting the arts has become much more altruistic. Â Once I saw the effects of public art firsthand it became easier to drop my own selfish motives and rely on the important purpose public art serves as my soapbox. In an article by Jack Becker entitled “Public Art: An Essential Component of Creating Communities” he identifies four main purposes for public art: 1. Â To engage civic dialogue and community. Â 2. Â Attract attention and economic benefit. Â 3. Â Connect artists with communities. Â 4. Â Enhance public appreciation of art. Standing on the street at FestiFools or FoolMoon, I can see all four of these in play. Â As a student, I don’t see Ann Arbor as its own town very often, or at least I didn’t before FestiFools. Â I sort of thought of it as the land that holds U of M and not much else. Â Seeing the community interact and attend these events with neighbors and friends is really inspiring. Â It gets them talking about something other than Michigan football. Â Sometimes the puppets are political or controversial and a dialogue starts about why someone may have made that and what they are trying to say. Especially after FoolMoon, it is impossible to ignore the economic benefit to the community. Â Everyone is downtown at nighttime and they will probably get hungry or wander into shops they may not otherwise be inclined to stop by. Â The same can be said of a sculpture or mural. Â The public is attracted to aesthetic beauty and that will make them more likely to stop and observe what else is nearby. My first year with FestiFools part of my UROP assignment was to create a puppet. Â I did this willingly, although not with the splendor I may have hoped. Â I’m just not super talented in that type of art. Â It was still a blast to make and I really did become more connected with both the University students who were also creating their own puppets and the community supporters at the event who wanted to know more about what we had created. Â There is a bond in public art that is wholly unique: the viewer appreciates what you have done for them and thus wants to talk to you and hear more about it, and the artist gains appreciation for the community for whom she is creating because she sees that enthusiasm and often has sought the beauty in the community as inspiration. Number four is pretty self-explanatory. Â The more one is exposed to art, the more likely they are to appreciate it. Â And maybe I have just been reading too many dystopian novels recently, but try to imagine life without art. Â It is bleak. Â Imagine life without beauty. Â It is depressing. Â Art in everyday life enhances that everyday life. FestiFools has another mission of arts education. Â Detroit has cut arts funding in its public schools. Â FestiFools goes in and teaches these kids about art and tries to foster that appreciation that is gained from exposure to art. Â I know that it will always be an uphill battle to get funding for the arts, but the arts are so necessary. Â They have been proven time and again to improve students’ overall experiences at school along with intelligence and test scores. And I cannot stress enough, it has to be worth it just for the look on those kids’ faces. Â If you have time this weekend, stop by FoolMoon or FestiFools. Â Look at a sculpture. Â Take a long look at the mural on the side of Potbelly’s. Â Stop for a second and listen to the guy playing the washboard and harmonica on the Diag. Â Appreciate accessible art in everyday life. Step one: put out boxes full of pastel paint for people to step in. Step two: Lie down. Step three: allow them to walk all over you. Or something along those lines. This is the process of an artist currently being shown at a gallery here in Bologna. The Blu Gallery, a gallery sponsored by the modern art museum in Bologna, called MAMBO, is hosting Tatsunori Kano, a conceptual and experimental artist. The goal of this gallery is to be open to passerby and allow them to few the process of the artists. In this spirit, Kanoâ€™s current work is pulled out onto the street once every week and pedestrians are offered the chance to dip their shoes in colored pastel powders (a different color each week) and to walk across the painting, leaving whatever kind of tracks that they want. When the Tatsunori thinks it is ready he pulls it back into the gallery and sets to work on it himself. He uses different techniques to adjust the painting to his liking, including sprays, dusts, acrylics, and a whole array of strange brushes, not to mention shoes. Itâ€™s a really cool experience to watch him go to work on the piece. He moves so fast dipping brushes into jars and tapping powder onto the work as if he were planting grass seeds on a lawn. He picks up a giant straw and blows away the excess dust, clearing his workspace to know what he has. Kano climbs up a ladder to get a better view of the piece. Itâ€™s really quite exciting. You may be wondering why I ended up in some gallery on the streets of Bologna. Or you may just as easily not be wondering and I just needed some way of transitioning into it. Either way, itâ€™s a neat story, so Iâ€™m going to tell it (and yes, I did just say neat). I was walking down one of the streets this past Friday because I had to go to a bank that ate my ATM card the night before. They ended up not having it, so Iâ€™m a little screwed, but whateverâ€¦ right? Anyway, I passed this gallery on the way there and liked the looks of some of the works on the wall. On my way back I stopped in and started looking around. The gallery manager started talking to me (in Italian, I felt so cool!) and we talked about the artist and about arts, inc. at UofM. And Tatsunori Kano himself showed up and started talking to me. They told me about the process and the pedestrian aspect of the work. And then, to my surprise and excitement, he opened up a shoebox of blue dust and gave me a private go at the piece! So I started walking around on it with one of my blue shoes, and I was the only blue on it. Then he joined me and we just walked and jumped around on it. They told me to come back, so this weekend when the gallery was opened up and he was working on it I visited again. It was such a great experience, both for my Italian development and to see Kanoâ€™s process. Never turn down such an opportunity! That is what I learned from this. I also found this video of him working on this piece; itâ€™s kind of strange and long, but you can check it out and skim. There is this funny part in the middle where this guy in the background is eating something and awkwardly trying to move behind Kano. Worth a laugh, or at least a giggleâ€¦heehee. The same day that this happened I found a great bakery that has whole grain breadstuffs and a huge variety of yumminess, all biologically grown. All in all, a really great day!!!! Happy spring everyone! I hope the weather doesnâ€™t stay so crazy back there in Michigan J Itâ€™s really funny here though. They had a huge amount of snow for two weeks this year. They hadnâ€™t seen snow stick to the ground in 60 years, and this year there were at least 2 feet! And because of this freak weather and the hilarious chaos that ensued (no lie, supermarkets were emptied out like in a zombie apocalypse) a picture book of the snow is being published and released tomorrow! A picture book! A book is being published about the snow in Bologna! Now we know why Italy is not the world leader in anything. This past weekend I got in a small dispute with a stranger over some of Hip Hop’s most influential characters. I attempted to explain how, in my opinion, The Roots are more musically talented than the Wu Tang Clan. This gentlemen, my adversary, was steadfast in his devotion to the Wu Tang Clan. Allow me to explain myself, I pleaded. I understand how influential and pivotal the Wu Tang Clan were to the genre of Hip Hop music. They transformed it more significantly than possibly anyone other artists, and, in many people’s opinion, are considered to be the best rappers ever. I agree with this on some fronts. They were undoubtedly pioneers; but they primarily impacted the lyrical component of rap music. Their music is lyrically impeccable, it is true. It is sophisticated, meaningful and entertaining. Its use of wordplay and literary techniques are equal to those of playwrights and novelists. In fact, the “Hip Hop Shakespeare Company” conducts an exercise where they read lines from classic Shakespearian plays and sonnets or lines from Wu Tang Clan songs, and ask the audience to guess which one they come from. It is almost always impossible to tell, unless you have memorized both every word of Will’s and every word of Rae’s. From a lyrical standpoint, I understand why listeners have compared the Wu Tang Clan to the greatest playwright of all time. But I still like the Roots more.